You are currently browsing articles tagged Nether Wallop. Given that we spend so much of our time looking at places on maps, it is hard not to pay attention to some of the more memorable place names. There are some gems in the English countryside: places such as Nether Wallop in Hampshire, Wyre Piddle in Worcestershire, and my personal favourite address in Berkshire, Rotten Row, Tutts Clump. It certainly leads one to think about the origins and etymology of those names. We notice patterns when cataloguing collections from particular counties; there are lots of places in Sussex with the name component –hurst, and lots in Somerset that include Coombe or Combe. Incidentally, hurst is a reference to a ‘wooded hill’, and Combe essentially means ‘valley’ (see below for a link to a great website you can search for information like this). As I mentioned in a previous post, I have recently spent a lot of time cataloguing ploughs, and one of the most interesting things about the earlier ploughs is that their names often include the name of the county in which they were designed to be used. Ploughs might be heavy or light for different soil types or the gradient of the landscape. It is interesting to think that the names of the places in which those ploughs might have been used often reflect those same features of the landscape. At school in Redditch we were often told that the town was named for the bright red clay that passes for soil in the local area, and like Combe above, many other place names relate to hill and valley features. As objects often show the links between people and places, so too do the names we call those places. 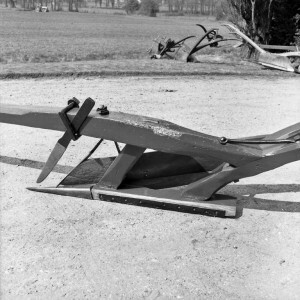 This is a Gloucestershire Long Plough (54/91), used at Bangrove Farm, Winchcombe. The farmer who used it said that the heavy plough was made to cope with the local clay-like soil, and that he had to hitch five Suffolk punch horses to it to get it going 'full pelt'. Reading, like many other places, is formed of a personal name and the –ing component – it means ‘the people of Reada’. Reada, according to an article in The Independent, was ‘an otherwise forgotten man… whose name suggests that he had red hair’. This feels appropriate, given that I am a redhead myself. Another somewhat amusing place name etymology is that of Nottingham. It is formed of a personal name, the ­–ing component, and the –ham component. In total, it formed Snotta-ingas-ham – the village of Snot’s people. Nottingham is, all things considered, a rather better name. It is outside the scope of this project to start recording the origins of the place names we are entering into a hierarchy. A project which is carrying out this valuable task is the Survey of English Place Names, at the English Place-Name Society and the Institute for Name-Studies at the University of Nottingham (or, the University of the village of Snot’s people). On their website, you can search a map with information about the origins of English place names. There is also a wealth of websites and books out there with information about this fascinating area. For me, it remains an interesting side topic to the main geographical cataloguing I do. Noticing these sorts of patterns in the names of places in different areas of the country helps me to get an even better appreciation of the significance of place and the landscape for people’s lives, and consequently, the objects in MERL’s collections. Perhaps there are some other great place names out there that you know about, or places that mean something to you – do comment on this post and share them. We might even have catalogued an object from there – we can let you know!